Yes, on successful completion of the course, you will receive Accredited Certification. Dependant on the experience of the delegates, depends on the length of the course, however, the course generally lasts between 2 and 4 hours. Yes, as long as there are adequate class room and welfare facilities available. Is face fit testing a legal requirment..? Yes, it is! Learn more about it here. A Face Fit Test will be completed on site with Accessible Ltd with their expert face fit testers around Lancashire and Yorkshire, we will come to site and take care of the face fit testing for your staff. We offer face fit training to the North West, around Lancashire and Yorkshire, and around the UK. We deliver the best face fit test to each operative to make sure you as an employer, comply with current face fit regulatory legislation and that your staffs breathing is protected from work related breathing difficulties. 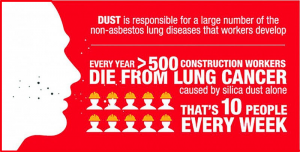 An employer in Lancashire and Yorkshire, you must provide the correct training in the use and care of respirators and Respiratory protective equipment (RPE) and Face Fit Tests in Lancashire and Yorkshire Must be carried out with this equipment. Many types of industry, during their work process, can generate hazardous substances, resulting in a requirement for Face Fit Training & Testing . Is designed to protect the wearer from hazards and has to be adequate and suitable to ensure the wearer is protected. What is RPE? Find out here. 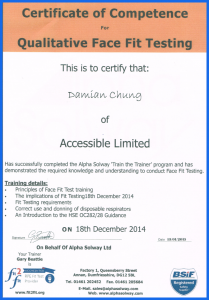 Accessible Ltd have experienced qualified face fit testers, who will come to your site, and complete Face Fit Tests on your staff and demonstrate how to fit their RPE correctly, so they know and understand, how that mask will feel on their face, when it is correctly fit. Once the Face Fit training is complete, we will individually Face Fit test each member of staff, with their RPE, we record and document the findings, for your records, in order for you to comply with current best practice and legislation. Failure to comply with Face Fit Testing legislation, not only puts your staff members, long term health at risk but could have real consequences to your business operations and leave your directors and managers open to a very real risk of prosecution under the corporate manslaughter act 2009, which may result in large fines or prison. Looking for the face fit testing cost? Get in touch using the form below or call us on 01282 504455 and speak to one of our advisors. Call 01282 504455 Now for a quotation.